The Best UK Retirement blogs from thousands of top UK blogs in our index using search and social metrics. Data will be refreshed once a week. 2.12 Notes From Retirement......................Where did the years go? UK Retirement newsletter is a comprehensive summary of the day's most important blog posts and news articles from the best UK Retirement websites on the web, and delivered to your email inbox each morning. To subscribe, simply provide us with your email address. Worthing, England About Blog Retirement Advantage provides simple, secure and flexible retirement income and equity release solutions. Read our blog covering retirement, pensions, health & finance from Retirement Advantage, the award-winning retirement specialists. Facebook fans 77. Twitter followers 1,346. UK About Blog I retired young, at 47. I'm blogging how much it costs to live and what I do with my extra free time in case this helps with your own decision to retire early. Facebook fans 78. Twitter followers 684. Facebook fans 83. Twitter followers 269. About Blog One man's search for the perfect retirement or the search for a new (ish) life. Bristol About Blog Assured Retirement Limited was created to provide a new range of simplified pension products designed for those who wish to access their pension savings in a flexible and lost cost manner. Our mission is to provide flexible retirement choices at the lowest possible cost. Facebook fans 19. Twitter followers 145. Facebook fans 36. Twitter followers 422. Bristol, England About Blog Musings of a retired but not retiring woman. This blog is a chance for me to share my experience of getting that balance between work and life. Even as a retired person you still work so I write about my adventures with travel, food, routines, finding a role and hopefully giving others ideas of how to strike that balance whether you are in paid work or not. Facebook fans n/a. Twitter followers 18,172. Bedfordshire, UK About Blog This blog is all about staying in good shape through the different seasons of life. By staying in good shape I mean physical and mental good health, plus getting the life-style right and managing the progression through life. I will be bringing articles and blog posts about making sure we stay healthy. London About Blog William Burrows is a financial adviser with Better Retirement and author of acclaimed retirement guides including "Retirement is a journey not an event" and "You and Your Pension Pot". William Burrows and Better Retirement will be pleased to help you make the right decisions at any stage of your retirement journey. 12. Notes From Retirement......................Where did the years go? Framlingham Suffolk About Blog Blog by John Brassey ex MD of Instanta. I retired year back but have continued blogging after enjoying writing Instanta’s blog for several years.This blog is charting our retirement and now and then there may be some words of helpful advice to businesses gained from my 40 years experience. Facebook fans n/a. Twitter followers 1,783. About Blog Award Winning Wealth Management Consultants, Retirement and Pension Specialist Financial Adviser serving Hampshire and Dorset. We provide clarity and peace of mind to those planning, or already enjoying their retirement. About Blog The RetireEasy 'LifePlan' retirement planner is a online tool enabling the creation of a comprehensive plan for retirement, empowering retirees to visualise future income, expenses & deal with multiple scenarios. Our key aim is to try & remove some of the fear for those entering later life by providing an online retirement planner that is free, easy-to use, intuitive & easy to understand. Facebook fans 143. Twitter followers 212. United Kingdom About Blog Blog by Ian Hurdley, Retired psychologist, getting angrier as I get older. Catholic trying to love everyone but finding it very difficult at times. opinionated and vocal. 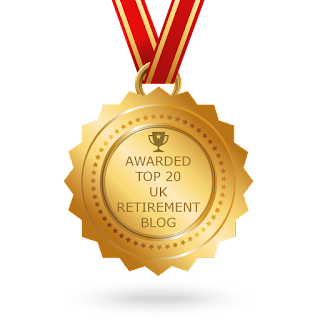 CONGRATULATIONS to every blogger that has made this Top UK Retirement Blogs list! This is the most comprehensive list of best UK Retirement blogs on the internet and I’m honoured to have you as part of this! I personally give you a high-five and want to thank you for your contribution to this world.